February 2015 - DC has a new contest, the DC Collectibles 250,000 Likes Sweepstakes. Enter by February 6th to win a big batch of merchandise. February 2015 - DC has a new contest, The Ultimate Harley Quinn Fan Giveaway. Enter by March 2nd to win a big batch of merchandise based on Harley Quinn. November 2014 - DC has a new contest, The Batman Holiday Sweepstakes. Enter by December 10th to win a big batch of merchandise based on Batman. October 2014 - DC has a new contest, The Flash Sweepstakes. Enter by November 4th to win a big batch of merchandise based on The Flash. - One (1) Flash Vol. 1: The Dastardly Death of the Rogues! Hatfield, PA, October, 2014 - K'NEX, the only U.S. construction toy company focused on Building Worlds Kids Love®, is pleased to announce the "K'NEX-A-Day Giveaway", a month long sweepstakes open to K'NEX fans ages 7+. During the K'NEX-A-Day Giveaway, K'NEX fans can log on to knex.com and enter for their chance to win a K'NEX building set. The sweepstakes features four different K'NEX building sets, with a different building set being given away each week. Each day, one randomly selected entrant will be chosen to win that week's prize. 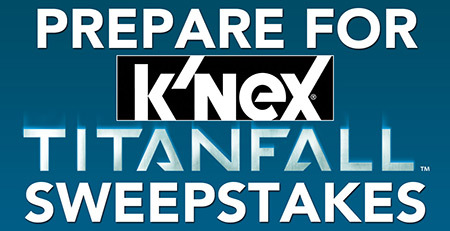 Fans simply visit http://www.knex.com/contest/knex-a-day/ to enter.